There's a bad disease out there that shows up every night in veterinary ERs: urethral obstruction. Male cats are prone to a blockage in their urethra, the tube that carries urine from the bladder to the litter box. When it happens, things go downhill in a hurry. Urethral obstruction is a complex and poorly understood disease, but the plumbing part of it is simple: when waste products can’t be gotten rid of, patients get very sick very fast, and many won’t recover. Despite some intense scientific scrutiny, no single cause has been found. Sure, for the urethral obstructions, we know the cause: a toothpaste-y substance with the sci-fi name of Matrix. How and why some cats produce this gunk and some cats don’t is still a mystery. Some veterinary researchers think stress plays a role, and diet certainly has some impact, but the only thing that has been shown to consistently reduce the rate of obstructions is increased water intake. Cats are desert creatures and are very good at conserving water when it’s scarce. When this happens, they make very concentrated urine - just the kind of urine that matrix likes to form in. Likewise, when a source of fresh, running water is found, they will often “tank up” since the next one could be far away over the next sand dune. When cats increase their water intake with canned food or better water sources, they make dilute urine that’s less prone to lead to obstruction-forming matrix. Less matrix means less obstructions and more happy cats. In advanced cases, where the urine flow has been stopped for more than 24 hours, cats can become systemically ill from retained toxins. They often start vomiting or become very weak and lethargic. Death usually happens within 48 hours, and it’s not a pleasant way to go. The pain with this disease is immense. Imagine your own discomfort if you couldn’t use the bathroom for a whole day. The course after unblocking these cats is just as unpredictable and mysterious as the factors leading up to the obstruction. Some cats are released from the hospital never to suffer another episode, while others will have repeated occurrences days, weeks, or years later. This is an inhumane and costly disease. As an ER veterinarian with 18 years of experience, I saw and treated hundreds if not thousands of blocked cats. While it’s not totally preventable, anything that can be done to decrease the suffering of these poor cats would be of huge benefit to pets and pet owners. I routinely encouraged pet owners of blocked cats to take a few simple steps to increase water intake and decrease the risk. Have many water stations throughout the house. Put a water bowl on each floor, too. Cats, being fairly lazy creatures, may not want to walk up a flight of steps to get a drink. If the bowl is nearby, they may go for it. Feed canned food. Canned food is mostly water and has been scientifically shown to lessen the chances of obstruction. Canned food, while messier and more of a hassle than dry food, will force the cat to consume water and decrease the chance of becoming blocked. 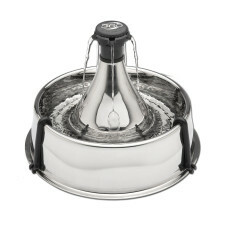 Get a pet fountain. 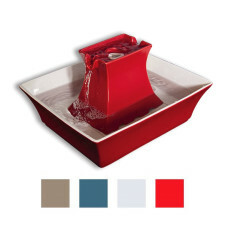 Designed by a veterinarian who I can only assume was tired of seeing blocked cats suffer, circulating water fountains give the illusion of running water, which most cats love. How many times have you seen your cat at the faucet, hoping for a drop to fall? 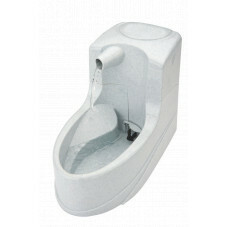 Pet water fountains fulfil the dream of many a cat – running water. The fact that it’s not really running and that it circulates water through a pump and filter doesn’t matter to them. Cats drink more from a water source that’s fresher, and as a result are better hydrated and less likely to suffer an obstruction. Some of these are easy, and some require a little effort. But if you’ve ever had a blocked cat or know someone who has, you know that anything you can do to prevent another middle-of-the-night trip to the ER would be worth it, not to mention reducing the risk of your cat suffering a painful episode of urinary obstruction. 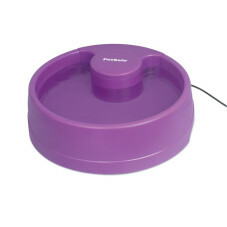 I got my Drinkwell® fountain many years back, and my cats love it. I have never had a blocked cat of my own, but I feel better knowing that they are happy to drink out of it, and I don’t have to worry about leaving a faucet running. I’m one of the lucky ones. For those cats with a history of urethral obstruction, it goes from convenient household appliance to absolute lifesaver.